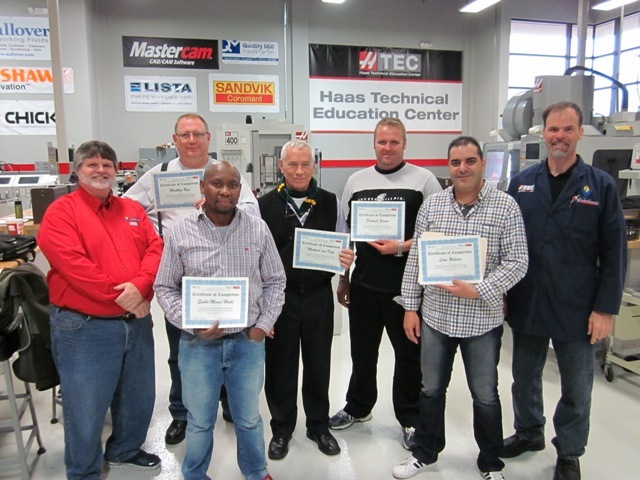 With scholarships provided to the teachers by the Gene Haas Foundation in the United States, and the National Tooling Initiative Programme in South Africa, the Vincennes University HTEC Teacher Training facility hosted two groups of instructors from South Africa for a week of training the weeks of March 9 and the week of March 23, 2015. NIMS has partnered with the National Tooling Initiative Programme, based in South Aftrica, to train and prepare an internationally competitive workforce and to ultimately assist individuals in developing the skills needed for a manufacturing career. . . . 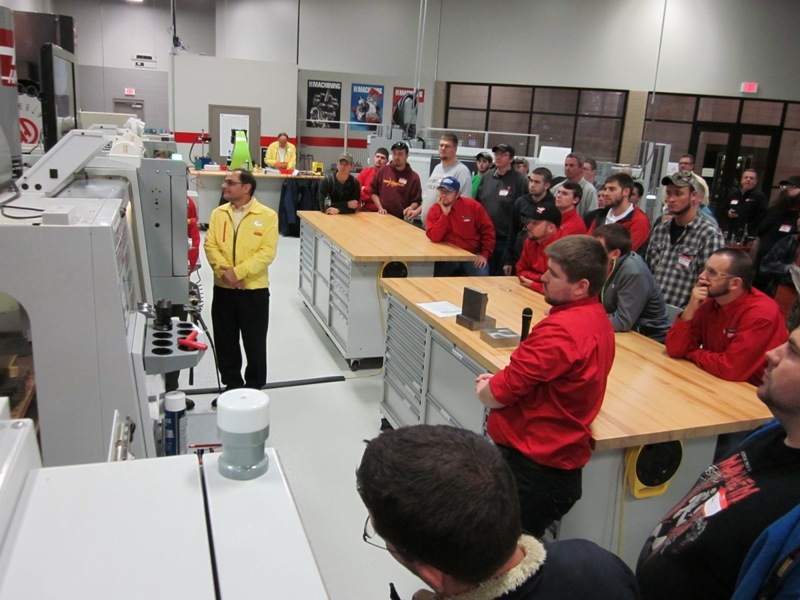 The Vincennes University HTEC teamed up with the VU Precision Machining Technology program to host the regional SkillsUSA machining competition on February 14, 2015. High school students enrolled in machining programs in Southern Indiana competed in the brand new CNC Technician competition for the first time in the HTEC CNC machining lab. 'It was a pleasure to have the students competing in our lab. 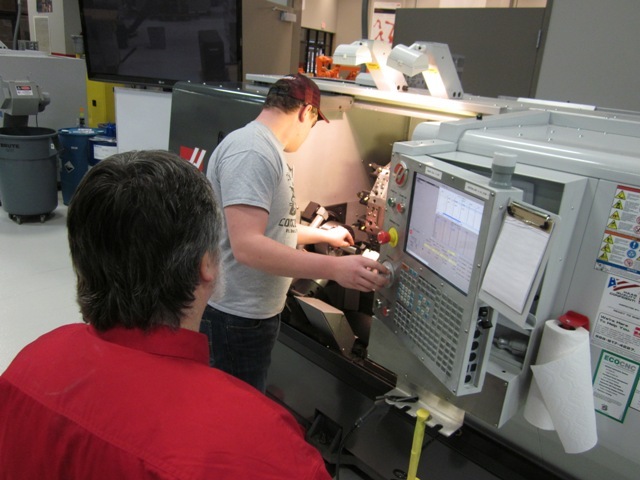 Instructors Bob Nash and Mark Stockhover did a great job of monitoring the students as they completed set up, programming, operation and inspection work on the Haas CNC machining centers and turn . . .
On November 5, 2014 Chuck Tate, John Pusatera and Shane Sievers of Sandvik came to the Vincennes University HTEC to present an excellent seminar entitled 'The Modern Art of Milling'. In attendance at the event where 15 students and staff from the VU HTEC CNC Machinist NOW program, about 20 VU Precision Machining Technology students, and about a dozen machining professionals from industry. Did you know that it takes roughly 4 inserts to manufacture a car, and 3000 inserts to manufacture a jet airplane? Do you know the 'Golden Rule' of Chip making? The answer is 'Thick to Thin'. These things alo . 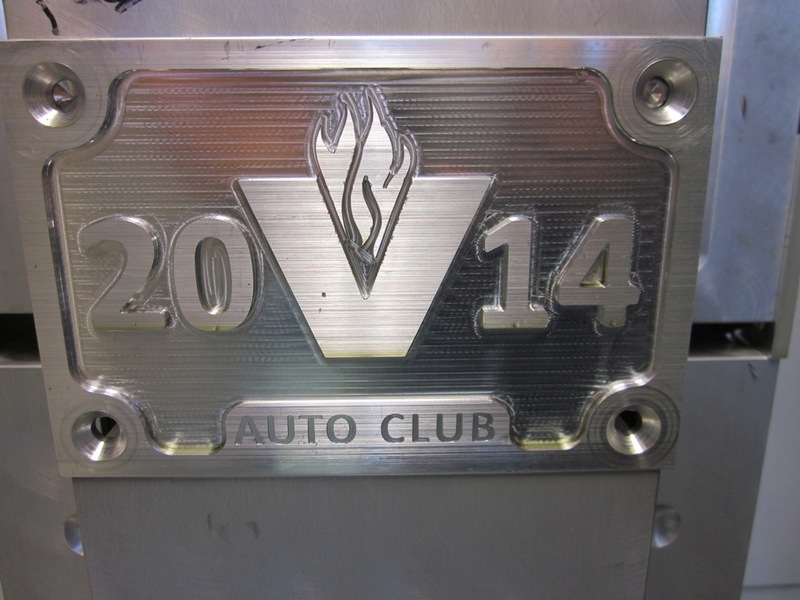 . .
With the annual Vincennes University Auto Club car show coming up on November 1, 2014, the CNC Machinist NOW students committed to manufacture 33 aluminum award plaques. The plaques will be mounted on a wood base and awarded to the winners of the various categories at the Saturday car show. In addition to helping out the Auto Club the students benefited from the project by learning how to setup a Haas EC-400 with dual pallets and multiple dual action Chick vises. The process included indicating the tombstones in, setting multiple work offsets, using a main program to establish the A-axis orien . . . 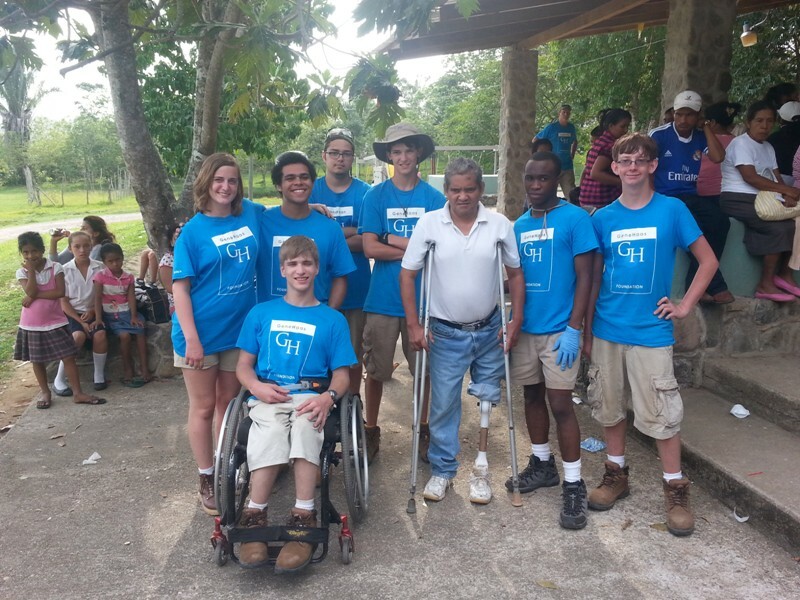 In partnership with the Gene Haas Foundation, the Society of Manufacturing Engineers Foundation (SME), Curbell Plastics and Brian Copes and his Calera High School students in Calera, Alabama, the Vincennes University CNC Machinist NOW students machined the components for 20 prosthetic legs that are now in use by citizens in the country of Honduras. For more details, please copy and paste this address in your web browser: http://ghaasfoundation.org/sky-calera-high-school-honduras-power-plant-and-prosthetics-project/#more-153. 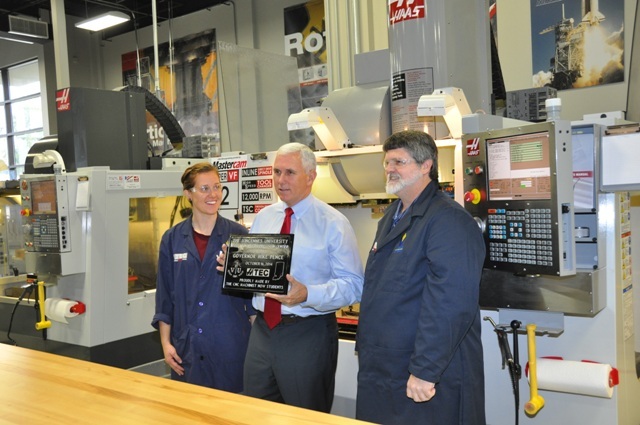 On October 16, 2014 Indiana Governor Mike Pence made a stop in the HTEC CNC lab during his visit to Vincennes University. Governor Pence was greeted by the CNC Machinist NOW students who were anxious to have the Governor press the green cycle start button on the Haas VF2 in order to complete the machining of the commemorative plaque that they had designed, setup and machined. The students milled the basic shape of the plaque, powder coated it gloss black, and then engraved the details, all except the outline of the state of Indiana and a star representing Vincennes. After Governor Pence comple . . .